Five years ago, a team of University of California San Diego neurobiologists published surprising findings describing how rats' brain cells adopted new chemical codes when subjected to significant changes in natural light exposure–much as humans suffer from "winter blues," the type of depression known as seasonal affective disorder. A new study implicates a role for light-induced electrical activity in controlling chemical codes. In the earlier studies, the researchers showed for the first time that rats' nerve cells switched to a new chemical code when the animals were subjected to large shifts in their day and night cycles, demonstrating that adult mammalian brains are much more malleable than once believed. At the time, the researchers were unclear about the mechanisms behind the code switching, which is mediated by chemical messengers known as neurotransmitters. How exactly does this plasticity work in the brain? Now, the scientists' results described April 23 in the Proceedings of the National Academy of Sciences (PNAS) identify the mechanism behind this neurotransmitter switching, with possible implications for chemical imbalances in the brain underlying mental illness. In their PNAS study, Da Meng, Hui-quan Li, Stefan Leutgeb and Nicholas Spitzer of UC San Diego's Division of Biological Sciences, along with Karl Deisseroth of Stanford University, find that light-induced electrical activity in specific brain neurons lies at the root of the change in their neurotransmitters. "In this paper we addressed the question of the regulatory mechanism enabling neurotransmitter switching," said Spitzer, senior author of the paper and co-director of the Kavli Institute for Brain and Mind. "We discovered that manipulating the electrical activity in the brain prevented the change in neurotransmitter identity that elicits the animals' anxious and depressed behavior. We think that this work opens the door to other studies of activity-dependent mechanisms in psychiatric disorders." In the new findings, the researchers studied the change in neurotransmitter identity when rats, which are nocturnal, are exposed to long day lengths. 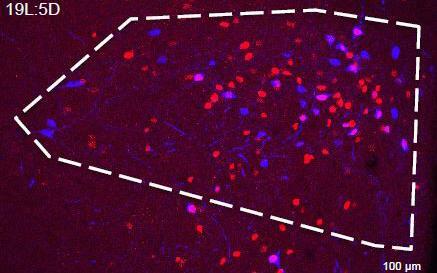 This exposure led to elevated activity of paraventricular (PaVN) neurons in the hypothalamus and by consequence a loss in their expression of dopamine, a neurotransmitter that is linked with many aspects of normal behavior. When the researchers suppressed the elevation of activity that resulted from the long-day exposure, exclusively in the PaVN neurons, they blocked the transmitter switch that would have occurred under these normal light conditions. The new studies render other mechanisms for the transmitter switch unlikely, including altered metabolism, hormonal stimulation or influence from other classes of cells. "Because the long photoperiods are stressful to rodents (analogous to short-day photoperiods for people), the findings raise the possibility that various forms of stress may induce transmitter switching that contributes to the chemical imbalances in the brain underlying many psychiatric conditions," said Spitzer. Implications of the findings could be relevant to autism spectrum disorders and post-traumatic stress disorder, areas the researchers are now investigating with their new results in hand. A Howard Hughes Medical Institute International Predoctoral Fellowship and grants from the Ellison Medical Foundation and the W.M. Keck Foundation supported the research.